AllJ Slots is a great promotional tool to use to draw people over to your table or booth at your trade show. Setting the slot machine reels to include images of your prizes, products and services, and even your corporate logo, provides a level of branding you won't find elsewhere. If you're hoping to draw more traffic over to your table or booth, a lively prize giveaway game will do the trick. 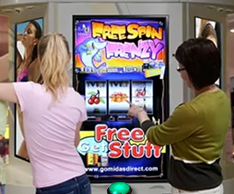 AllJ Slots is a High Profile Attention Getter that will gain attention with its exciting audio and visual effects. Not to mention the possibility of winning prizes. Run AllJ Slots on a laptop or PC as a Trade Show Promotion to get lots of attention at your next Trade Show! You can even display the game play on a high profile wide screen (in portrait mode shown on the left with a custom background) to grab attention from greater distances. Customize the spinning reels with images of your prizes, your company logos, products & services, etc. Apply your branding to the background screen imagery, and customize the audio to generate the perfect level of excitement that's sure to get attention! There's no other software out there that will provide as much brandability and prize giveaway control. Controlling pay-out frequency and the ability to cap/limit the number of prizes awarded, are just some of the features that give you control of your event's prize giveaways. 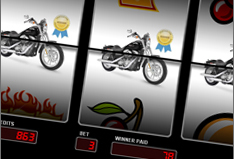 You can also set a limit on any of the prizes that you want awarded, and AllJ Slots manages it for you. For example, if you have 1 Grand Prize and 20 Tshirts, you will be able to set the maximum number of times a particular Prize (pay-line) will hit. Once that limit has been reached, the game will simply avoid that pay-line. This allows you to give away exactly the number of prizes you have to award. You can also "fix" the order and frequency in which your prizes are awarded. This will help you set the pace of the giveaways more precisely to meet your needs. Collect lead information from your potential customers before they get to play! The built-in Lead Generation tool will help you collect information from your visitors before they are permitted to spin/play. This data is collected and stored in an easily accessible CSV (Microsoft Excel Compatible) file format. This data entry screen comes up automatically when they attempt to play, and is Touch Screen Compatible. This screen will also work with a keyboard. PAY LINE TRIGGERED BEACON LIGHT NOW AVAILABLE! 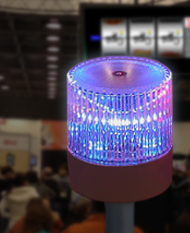 The "Pay Line Triggered Beacon Light" adds a good bit of excitement to your gameplay and your prize giveaways by adding a visual element that can grab attention from a distance. Combined with lively audio, this can be a great crowd pleaser! The light beacons that we've integrated, the USB HID Light Indicators by Delcom Products, support multiple Light Show Profiles, allowing you to choose different colors, pre-programmed light shows, table top and pole mounted options, and more. 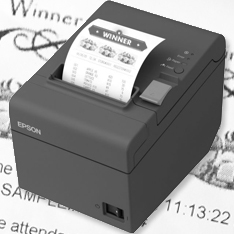 Thermal Receipt Printers that will allow you to automatically print prize winner receipts. A Thermal Receipt Printer will allow you to take advantage of the built-in Prize Claim Voucher and Cashout Claim Voucher features. The Epson TM-T20 Thermal Receipt Printer is a good, affordable and compatible option, going for around $170. The Large Illuminated USB Button, by USBButtons.com is an attractive large illuminated button that comes in a variety of colors, and will simplify the play experience with an inviting "press to play" approach. It's Plug-n-Play, requires no extra configuration or software/driver installation, and costs around $100-$150. The button measures just under 4 inches in diameter and has a solid click action when pressed. 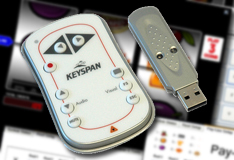 A Wireless Powerpoint Controller will allow you to take advantage of PLAY/PAUSE/RESET functions, as well as a secret JACKPOT TRIGGER options supported by AllJ Slots. These controllers only cost around $40, and can be purchased at http://www.tripplite.com. Be sure to select a model that supports the ESC and F5 functions (the PR-EZ1 works nicely, is very affordable, and fits nicely in your pocket). The "Jackpot Trigger" is the most popular use of the wireless controllers, giving you the opportunity to secretly award a prize at any time with the touch of a button. 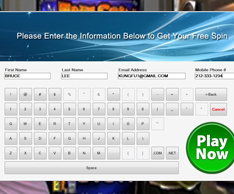 We're always integrating exciting new features with AllJ Slots. Things that will give you more control or add even more excitement to the prize giveaways at your booth. All licenses come with free version updates. 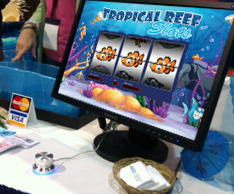 AllJ Slots Slot Machine Software is a very effective way to draw potential customers to your trade show table or booth. The prize giveaways, exciting audio events and realistic visuals, all add a level of life & excitement that's sure to get lots of attention. Download the FREE TRIAL VERSION HERE and try it out, watch our VIDEOS, or download the USER GUIDE to review all of the many useful features offered by AllJ Slots 2.2.